Why is Mexican Street Food Popular? Mexican street food is popular because it is cheap, tasty and easily available. 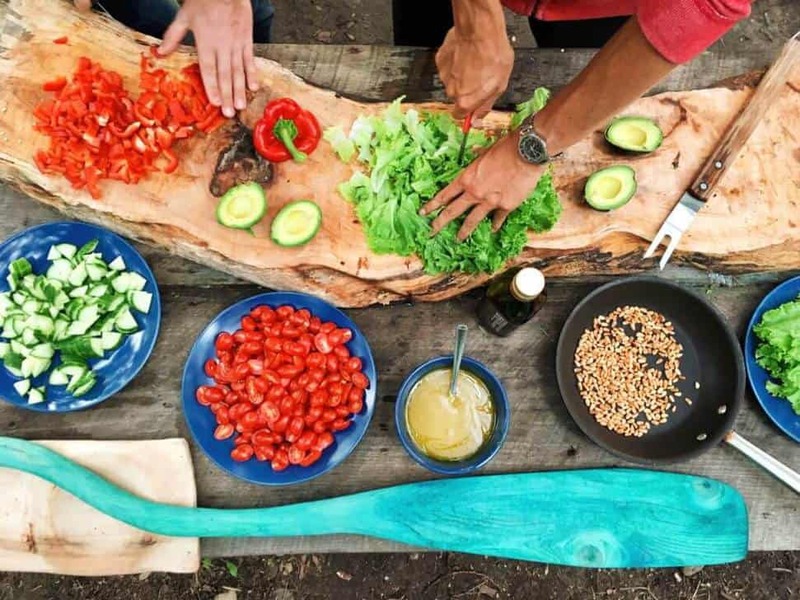 It is said that ‘food is the ingredient that binds us together’ and in Mexico 58% of the population eat street food at least once a week regardless of their economic standing. Food in Mexico is a social affair and Mexicans enjoy coming together to eat street foods. In a nutshell, Mexican street food is the original ‘fast food’. There is no waiting around, your food is cooked quickly in front of your eyes. This kind of popular Mexican food is found on many Mexico streets. 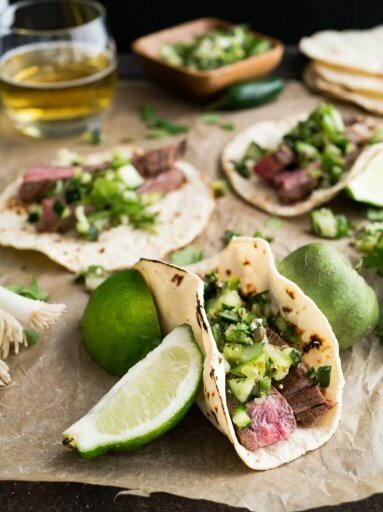 Mexico street food does vary slightly from region to region but the basics remain the same wherever you are. Whilst backpacking the Yucatan peninsula, we enjoyed trying out traditional Yucatan food and authentic Mexican fare. In general, Yucatan street food is good quality and has plenty of flavour. 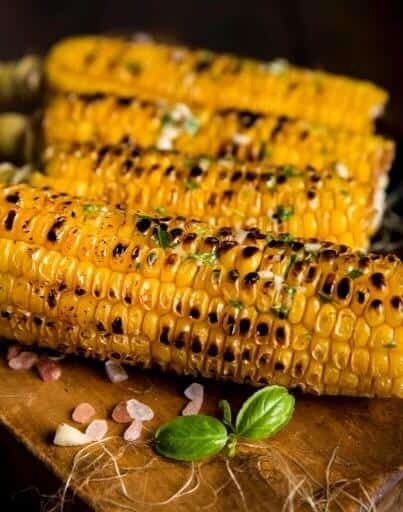 Fresh corn wrapped Mexican food tastes completely different to the tortillas we can find in English supermarkets. When we travel, we enjoy tasting the different dishes that each country can offer. Obviously, you can go to a restaurant and enjoy a nice evening in a beautiful location with a sea view and this is very romantic. However, when we want to mingle with the locals and taste authentic, cheap, savoury food, the best places to find are a small Mexican street vendor or small cantinas. These vendors are also preserving ‘food culture’ or the food of Mexico as they pass recipes on from generation to generation. Is It Safe to Eat Mexican Street Food? The simple answer is yes it is! If you want to eat like a local and have an authentic experience, then you should try the best Mexican dishes. Of course, use your common sense and ask yourself these questions as you look at the stand: Does the cooking area look clean? Is the food being cooked fresh in front of you? Don’t forget that the food is being cooked at high temperatures, so any harmful bacteria should be killed. Another good sign is a queue of locals. If the locals are eating from the stall, then it is probably for a good reason. Often the queues contain people from local offices and shoppers alike, so the food should be tasty, quick and of a high quality. Remember to ask the sellers about what they recommend. Ask them for their list of popular Mexican food. In our experience, locals love to share their knowledge and passion for what they are selling. This is a great way of finding out about top Mexican dishes. 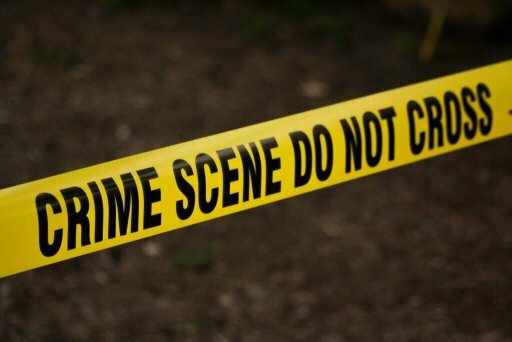 Click here for information about safety in Mexico. What Are The Best Mexican Street Snacks? Some of the best Mexican street snacks are Tacos, Quesadillas, Burritos and Tortas. Mexican street food is called ‘antojitos’ which means ‘little cravings’. It is prepared by independent vendors and sold from small stands on the street. Mexico street food varies from stall to stall, so take a good look at what is on offer as stalls are often clustered together. Mexican street food is not a formal meal and is usually based on corn products. 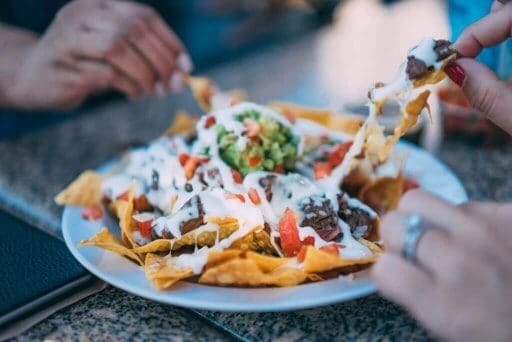 You may think you’ve eaten these Mexican dishes in popular Mexican restaurant chains around the word, but nothing can compare to the flavours of authentic street food prepared by locals. Before you buy, it’s good to know something about basic Mexico food names, so check out our Mexican foods list below. Tacos can by typically found on most street food stalls. They are small, folded Tortillas with a choice of filling. There are plenty of different fillings to choose from. Most stalls have a speciality filling such as Pastor (pork marinated in mild chilli pepper, onions and pineapple juice which is deliciously juicy) or Asada (steak grilled over charcoal). Additionally, you can choose from Chorizo, Carnitas (diced pork flavoured with orange rind) or shrimps. 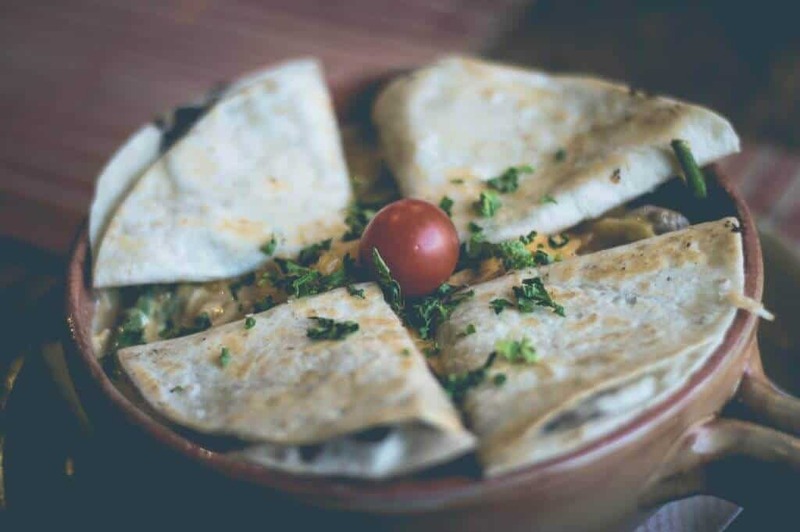 The name Quesadillas derives from the Spanish word for cheese which is ‘queso’. These are like Tacos but much bigger and folded in half with melted cheese inside and a range of other optional fillings. Burritos are large flour tortillas which are filled with various ingredients. Unlike a Taco, they are closed-ended cylinders which can be picked up to eat. These are more substantial than typical street food and sometimes need to be eaten with a knife and fork rather than fingers! Tortas are basically rolls which are cut in half to make thick sandwiches. You will be offered similar fillings to Tacos. We found that Tortas were very good as breakfast as they set you up for the day. This was our choice of Valladolid street food whilst waiting for our bus to Chequila. Teleras are the base bread for the Torta. They are flat rolls with a soft texture inside and crispy crust on the outside and are the staple bread for Mexican sandwiches. How Much Does Mexican Street Food Cost? Mexican street food is extremely cheap. For around 20 pesos (70 pence), you can eat small Tacos described above, perhaps the most popular food in Mexican street food. Order several and you will be full! Check our our Travel Resources page for accessories to keep your money safe whilst you are trying foods in Mexico. 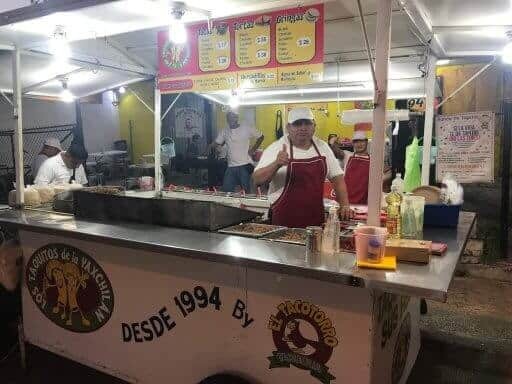 Where Can You Find A Mexican Street Food Vendor? 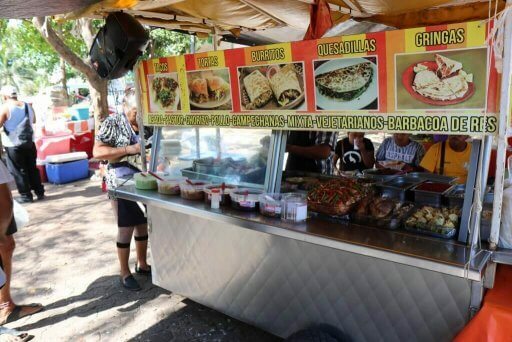 You can find Mexican street food vendors easily in the streets around market and public transport depots. Another way to find them is by wandering and getting lost in the town. In Cancun, we stumbled across a great street food stand with a team of welcoming people. This place is at the corner of Punta Nicchehabi and Avenue Yaxchilan between Mercado 23 and Mercado 28. The stall was clean and the food was tasty. Also, the owner was happy to make recommendations, there were places to sit and the staff offered us more and cleared away. One of our cheapest, but tastiest meals. Happy days! Are you usually scared of eating street food? We hope that we’ve inspired you to try Mexican street food whilst you are travelling in Mexico. If so, share your experience of eating Mexican foods in Mexico by commenting below. We’d love to hear about your favourites! Click here to read our article on backpacking in the Yucatan and the Yucatan in pictures. 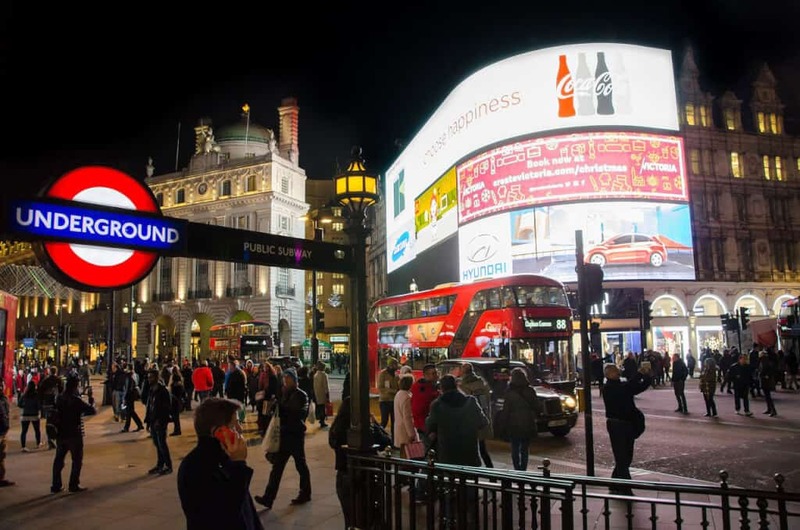 A Full Guide to London Tube How Old is the London Underground? 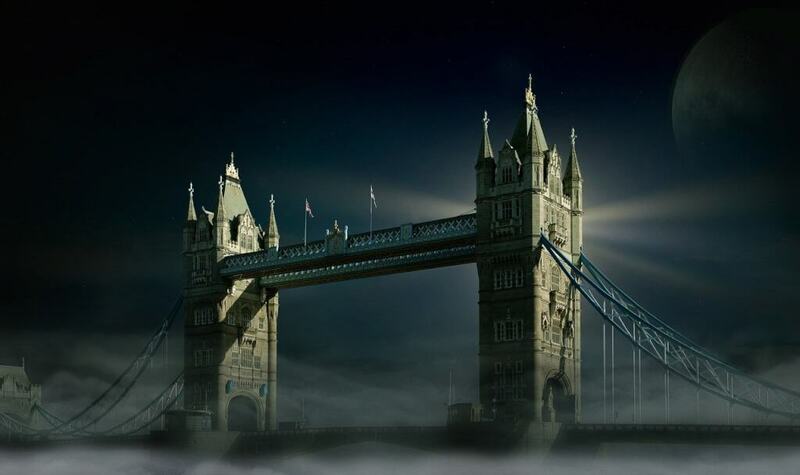 London Tube was the first underground in the world and opened in 1863. This Blog is also your Blog. Be part of the community by sharing with your friends. If you want to see more, then follow us on social media. Join our Community and Get Free Advice and Travel tips.